Here on Isabela, there is quite literally something for everyone. I take great pleasure when I observe how each one of of my guests experiences this enchanted ground from a difference perspective. Much is not predictable but I know that everyone will find something to love and treasure here. In Part I of our tour of the vast resources of Isla Isabela we visited the town of Puerto Villamil and the many intriguing visitor sites accessible from this small hamlet of just 2200 souls. In Part II, I took you to the magnificent beaches, coves, inlets, mangrove forests and snorkeling sites that surround this diverse island. Here, in Part III, I focus on the challenging and intriguing hiking opportunities that await those with a sense of adventure who are eager to examine the volcanoes of Isabela and experience the moonscapes, lava formations, calderas on the land and the astonishing vistas of the island and ocean from atop this remarkable Isla Isabela. 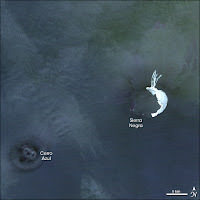 I have written three extensive posts about the geography and geology of the Galapagos Islands. Learning how the volcanoes were formed by the Movement of Tectonic Plates and the eruption of lava that forms the actual Volcanic Mountains is a great introduction to understanding and differentiating the volcanoes of Isla Isabela. Reading about the Ocean Currents will begin to acquaint you with the marine life and special creatures that live on the Galapagos Islands. Isabela's volcanoes, from north to south, are Volcan Wolf, Volcan Ecuador, Volcan Darwin, Volvan Alcedo, Volcan Sierra Negra/Volcan Chico and Volcan Cerro Azul. 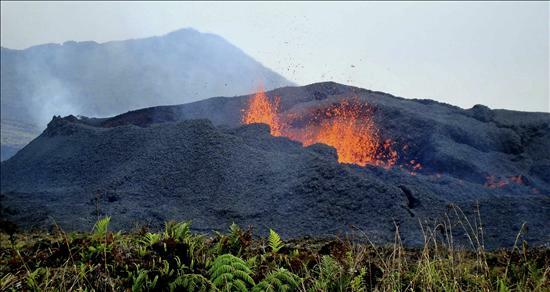 All the volcanoes are still active, making Isabela one of the most volcanically active places on earth. Of all of the volcanoes in the Galapagos archipelago, Volcan Wolf has the highest elevation at 5600 feet. 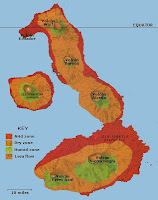 Notably the volcanoes in the western islands of Isabela and Fernandino do tend to be higher than those in the older eastern islands. Wolf has all the characteristics of a traditional shield volcano with a soup-bowl shape. Of Isabela Island’s six volcanoes, it is the most northerly and is situated directly straddling the Equator. 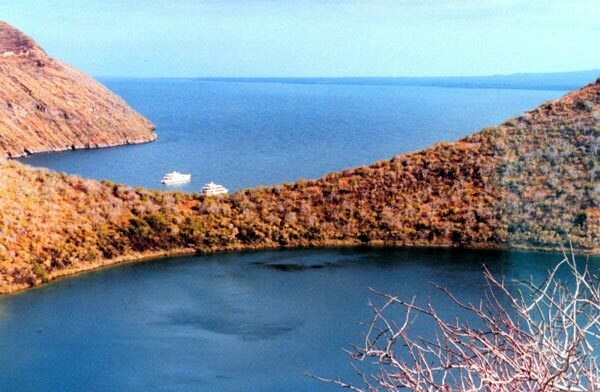 Its caldera is about 7 kilometers across and about 700 meters deep. The slopes to the caldera are quite steep; in some areas the grade is up to 35 degrees. The sheerness, along with the fact that this is Aa lava, make this a difficult climb. 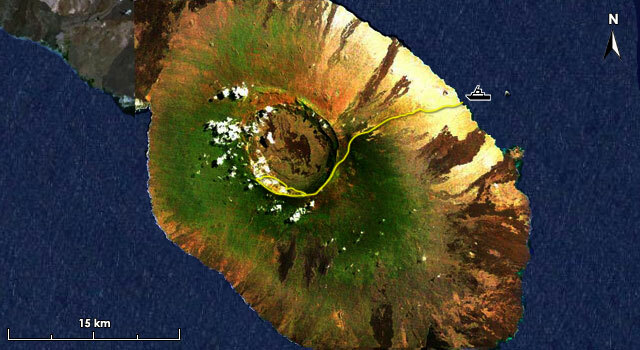 The combination of fresh green vegetation and old lava flows encircle the elongated caldera. 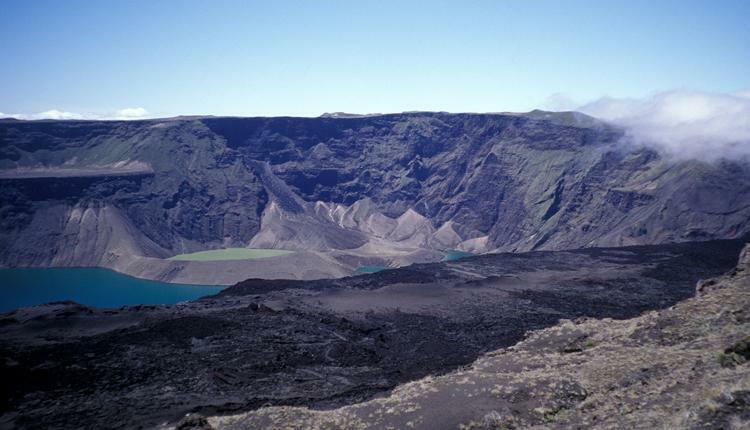 The most distinctive features of Volcan Wolf volcano, as with all Galápagos-type shields, are its shape and the distribution of volcanic vents, which are located in three clusters along its flank, below the caldera wall and on the caldera floor. This means, essentially, that it has three eruption sources. 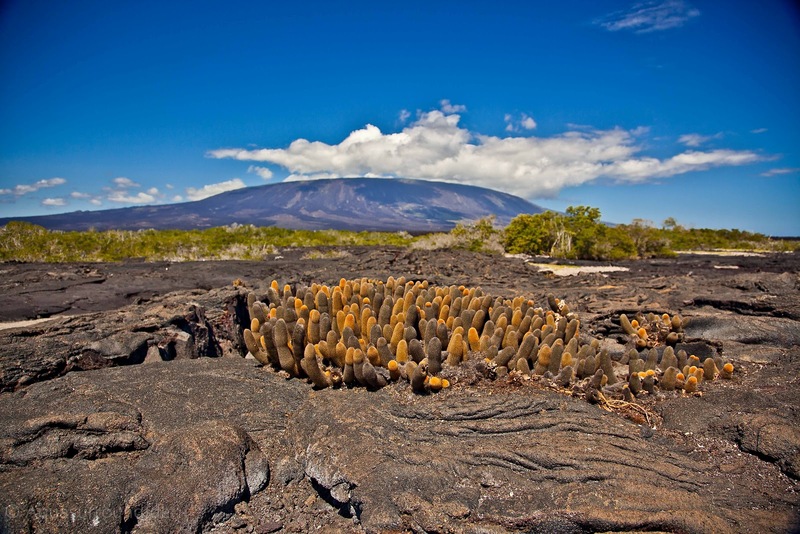 According to studies undertaken by Cornell University, Volcan Wolf is also distinguished by its isotope ratios; it lava is more typical of eruptions that occur in the middle of the ocean than those on islands, in general. This is important because the relative and absolute concentrations of the elements and their isotopes in the Earth reveal information about the age of a rock, the source of air or water and chemical processes in the atmosphere at the time of the eruption. And, since Wolf is so remote, the dating process gives us much information that humans could not have recorded at the time of the eruptions. Isabela Island itself is about 1,000,000 years old. However, actual record keeping of Volcan Wolf’s eruptions did not begin until 1797. These records reflect that since 1797, there have been 9 additional eruptions, the most recent in 1982. It is said that the 1982 eruption was spectacular and that fountains of lava spewed from vents in the caldera floor rising high above the rim. Scientific analysis proves that the newest lava flows are on the eastern and southern sides of the volcano and also within the caldera. One of the most thrilling features of Isabela is the different flora, fauna and terrain at each of the volcano sites. Each has developed its own ecosystem of plant and wild life. 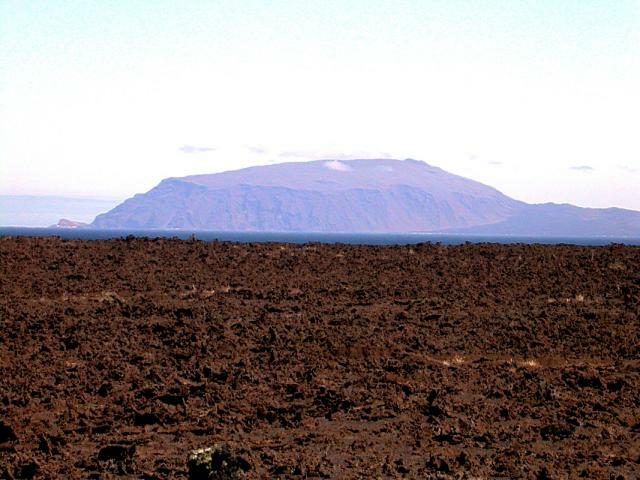 The differences arise from when the eruptions occurred, how far inland they are, the climate at the time as well as the ecological and environmental factors that contribute to diversity generally in the Galapagos Islands. For example, the Galapagos Tortoise subspecies at Wolf is seen no where else. Genochelone Nigra Becki has a saddleback shell and is found only in the oldest parts of the volcano – the parts that have the most ancient history of erupting where the vegetation has had an opportunity to regrow. So, you may see this unique subspecies only on the northern and western slopes. An interesting fact discovered by scientists studying Wolf Volcano is that the other Galapagos tortoise species that may be encountered around it are not endemic to Wolf, but rather interlopers from other Galapagos Islands, most likely left here by ships over the years. It was reported in a 2008 survey that all of the non-extinct Galapagos tortoise species and subspecies continue to roam around Volcan Wolf. In 2009, a remarkable announcement was made here. 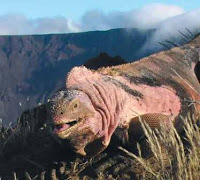 There is a new species of land iguana at Volcan Wolf. 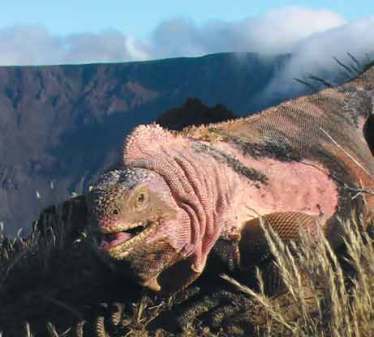 Although first discovered in 1986, the pink “Rosada” land iguana was officially recognized in 2009; its origin is uncertain, but it is seen nowhere else in the Galapagos or on earth. In fact, NASA scientists acknowledge the pink iguana as quite an anomaly. The research team describing the iguanas estimated their age at 5.7 million years, yet geologists estimate the age of Volcan Wolf at less than half a million years. 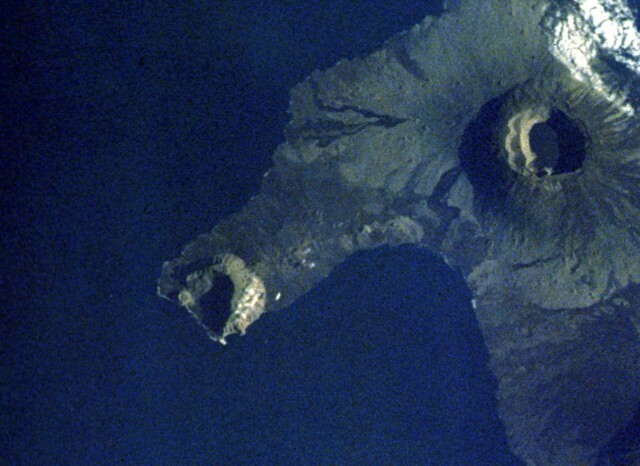 According to NASA, a possible explanation for this discrepancy is that the iguanas evolved on an older volcano that eventually sank below the waves, and their descendants moved to new quarters. You also can read more about pink iquanas at National Geographic. To learn about the many types of iguanas in the Galapagos - on the land and in the ocean, visit my post on Iguanas. 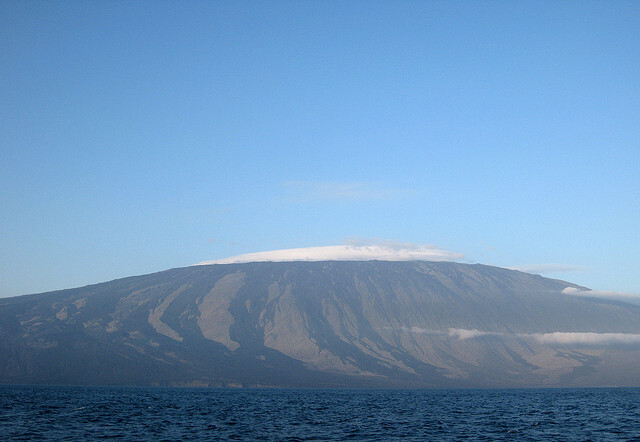 The most northwestern volcano on Isabela is Volcan Ecuador. 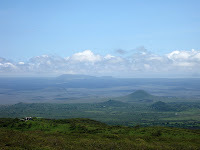 It is the smallest of Isabela’s volcanoes and the western side of its caldera now nearly reaches the ocean. This western edge is the “snout” of Isabela’s sea horse shape. On the eastern side, its vents connect to Volcan Wolf. Though there is no recorded eruption of Volcan Ecuador; because of its lava formations and dating, it is known to be relatively young. Volcan Ecuador, which actually straddles the Equator, has been referred to it as “one of the most geologically puzzling features in the Galapagos.” This extreme description comes from Volcan Ecuador’s asymmetry. Indeed, it looks from above to have a horseshoe shape. Unlike all the other Galapagos shield volcanoes with calderas, which are symmetrical, Volcan Ecuador is extremely steep on the north and south and has no western half at all. The steepness is attributed to erosion or fault lines, or a combination of these two factors. As for the western half: has it fallen back into the sea because of a fault or erosion or did it simply erupt this way to begin with? An underwater fault is the most widely accepted explanation. The proposition that erosion caused this unusual formation may sound intriguing, but is in reality unlikely. There is very little wind, certainly not enough to account for erosion of any magnitude. 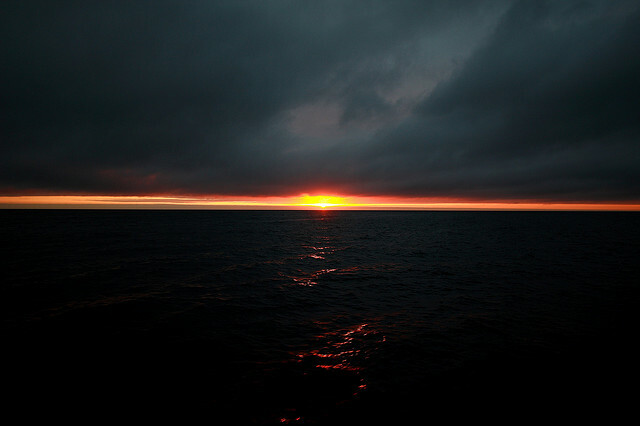 Therefore, waves would have had to be the source of the erosion, but waves of the height and strength that would have been necessary to undermine the entire western caldera and to cause the steepness in the north are not seen in the Galapagos. However, there probably is enough of an ongoing current that some of the southern sheerness could be wave-related. Another reason that this is an unlikely conclusion is that Volcan Ecuador appears to continue to be active and relatively young. As for the fault premise, perhaps there is a fault line underneath Volcan Ecuador. 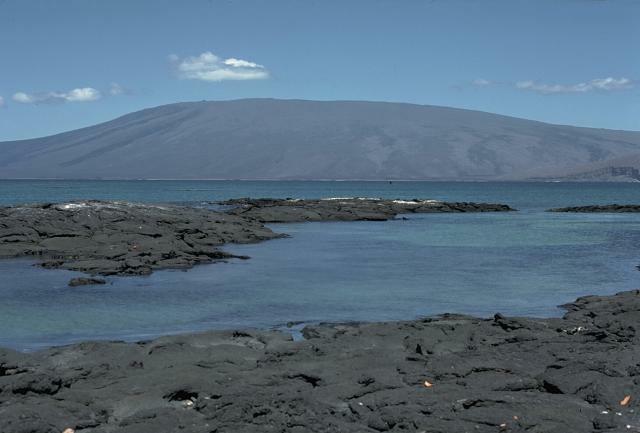 Though this has not been evidenced anywhere else in the Galapagos, it is a feature of some Hawaiian volcanoes where landslides due to internal faults have occurred. After considerable study of the volcano by Cornell University, it was concluded that Volcan Ecuador “experienced at least one sector collapse event that removed its western half.” The compositions of lavas exposed in the old caldera wall and fault scarps dissecting the outer shield together with young post-collapse lavas provide insight into the history of this volcano. Specifically, the sector collapse happened less than 100,000 years ago. It is now believed that before the collapse, the volcano was, like the others, symmetrical, but somehow the underground “plumbing” allowed some magma to bypass the central magma chamber. Volcan Ecuador could easily be mistaken for the remnant of an extinct volcano (and indeed was in some early geological studies). However, although there have been no reported historic eruptions, its central caldera and northern and eastern flanks are covered by many young lavas flows, some of which are probably not more than a few hundred years old. A fissure zone that runs east-northeast toward Volcan Wolf has been particularly active, and is constructing a ridge between the two volcanoes. It is possible that within the last 10,000 years or so, Volcan Ecuador was an island. Thus whatever its history, Volcan Ecuador is quite active, and is most likely still in a relatively youthful stage. 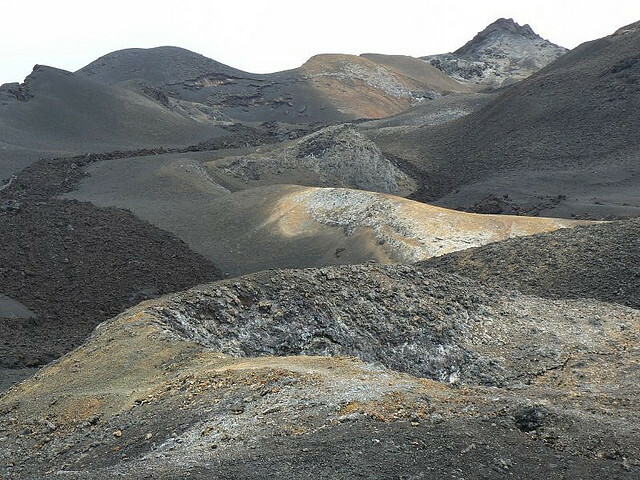 The landing site for Volcan Ecuador is Punta Vicente Roca, which is discussed in detail in my earlier post. Vicente Roca is actually the collapsed western floor of the volcano. The site has tuff cones and lava formations. So, before you embark on your Volcan Ecuador hike, be prepared for some of the most gorgeous and diverse marine life, great for photography and once-in-a-lifetime experiences. 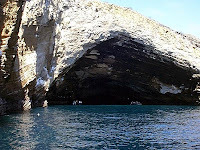 I have seen dolphins, whales, sea lions, Tortugas and every kind of Galapagos birdlife you can imagine. The nutrient-rich Cromwell Current feeds the life here. 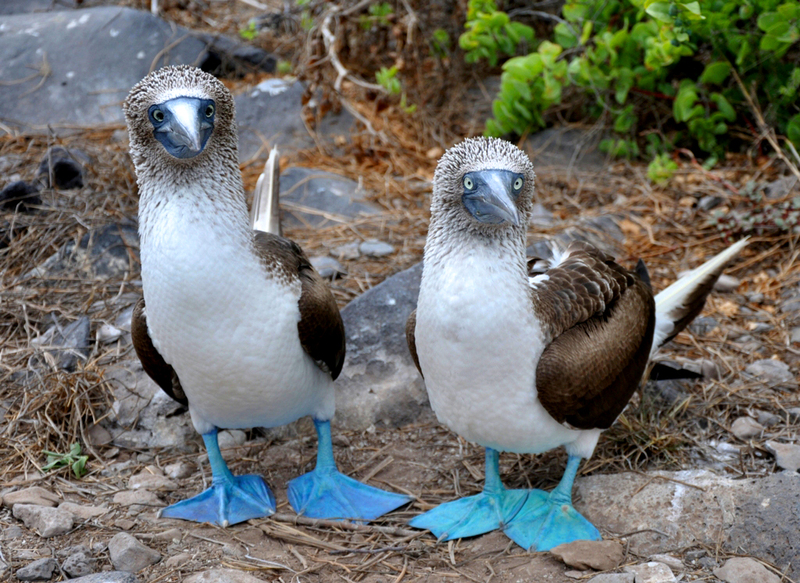 Also present are brown pelicans, blue-footed boobies, brown noddies, terns, shearwaters, and Galapagos Penguins. Here, natural erosion and the collapsed cone of Ecuador Volcano have formed dramatically carved cliffs and a system of rookeries and canals that are a geological wonder. This area also promises the highest probability of seeing whales any time of the year. For more about how the Cromwell Current is responsible for so much of the diverse marine life throughout the archipelago, read my post about Ocean Currents. Tagus Cove and Black Turtle Beach are two stunning visitor sites located to the west of Volcan Darwin near the Bolivar Channel that runs between Fernandina and Isabela Islands. You access the hike to Volcan Darwin from these points and proceed on a moderately long and difficult hike to Darwin Lake. The views on this hike are magnificent. The crater forms Darwin Lake, a highlight of the trip. The hike is difficult, in part because of the significance and depth of the volcanic rock that has amassed at this location. I’ve heard the gravelly rocky strata here referred to as petrified rain. 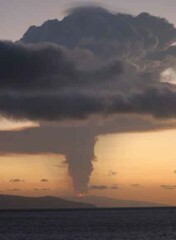 This occurred when the exploding volcanic ash and boiling lava contacted the water which, in turn, heated rapidly and evaporated or simply splashed high into the air. The ash that was falling but still in the air got wet, cooled quickly, and solidified in the air, coming down almost like balls of hail. It is also possible for such lava balls to form if it happens to rain when the ash is still in the air; again, the water rapidly cools the ash, which forms into a ball that lands on the surface. The other significant geological formations that occurred when Darwin Volcano erupted are called pyroclastic cones – Tagus Cove and Beagle Cone. This were created when the basaltic magma erupted from the central vent and came in contact with the cool salt waters of the Pacific Ocean. The boiling hot lava caused the water to steam. The breaking and fragmented magma combined with the steam and volcanic gases to form material called palagonite. The palagonite, essentially light weight ash roughly the consistency of flour, was thrown back into the air, and ultimately settled into a cone shape around the vent. The result? Interesting geological formations leading us to Volcan Darwin. This might be a good time to review how the volcanoes occurred and different types of lava formations written about in my earlier post about volcanoes. 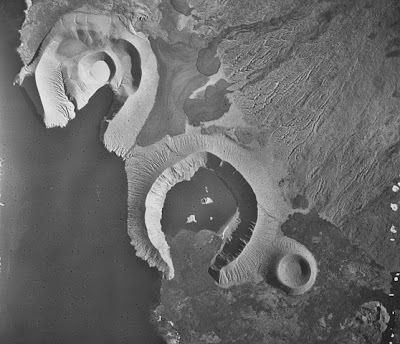 The tuff cones of Tagus (upper left) and Beagle (lower right) were formed by phreatomagmatic eruptions along the coast of Darwin volcano in the Galápagos Islands. The rim of Tagus is breached by Tagus Cove, a storied anchorage in the Galápagos archipelago visited by Darwin's vessel, the Beagle. 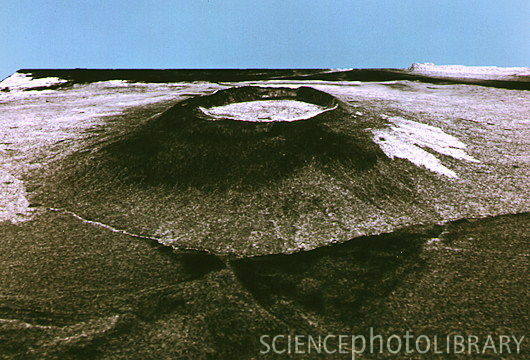 Tagus tuff cone has at least four nested craters, the youngest of which contains a small salt lake. 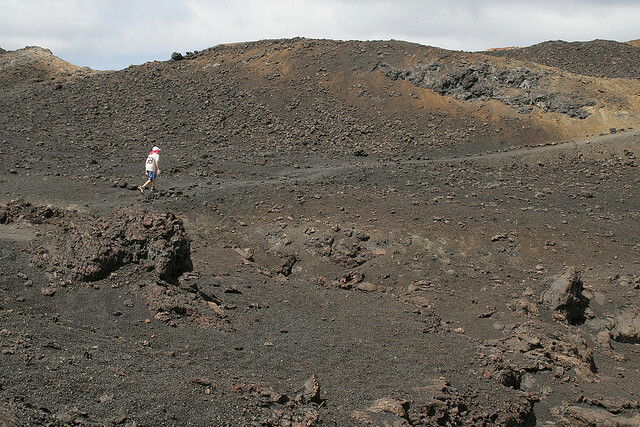 Fresh black lava flows from fissures of Darwin volcano largely surround the tuff cones. 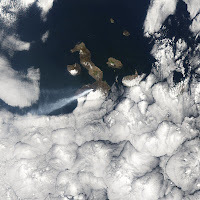 I'm intrigued by how little is actually known about the eruption history of Volcan Darwin, the second volcano south on Isabela and the fifth highest in the Galapagos system. The lack of information is due to the volcano's extreme remoteness. Volcan Darwin is situated between Volcans Wolf and Alcedo. 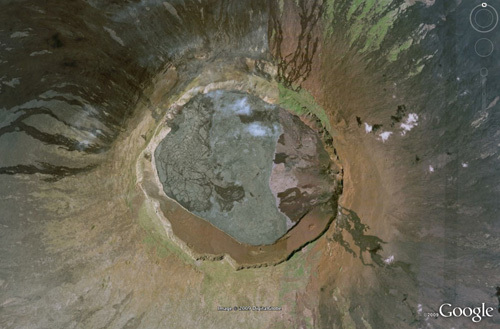 This shield volcano is nearly perfectly symmetrical and rises to an elevation of 1325 meters (4350 feet). Like the other western volcanos, it has a large central caldera, nearly 5 kilometers (3 miles) in diameter and 200 m deep (700 feet). 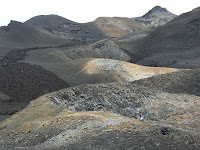 A number of young lava flows may be seen within the caldera, as well as on the flanks of the volcano. There are no confirmed historic eruptions of Volcan Darwin. We have learned that much of the the lava is no more than a few hundred years old, thus Volcan Darwin certainly remains an active volcano. This information was determined by a team of geologists from Cornell University in 1986. Like the other large western volcanos, much of the surface of Volcan Darwin is covered by Aa lavas, represented by its jagged and dangerous edges. Aa lava surfaces are extremely rough and much more difficult to walk on than the other type of lava surface, Pahoehoe. If you read my posts about Tagus Cove and Black Turtle Beach, you will recall that the hike to Volcan Darwin will provide you with the opportunity to see abundant sea, marine and avian life. Be prepared for brown pelicans and blue footed boobies. At the lower slopes of Volcan Darwin, you will see Palo Santo trees. These white-barked dwarf trees are leafless except for the wet season, but interesting at all times of year. The Galápagos Islands provide a window on time. In a geologic sense, the islands are young, yet they appear ancient. The largest animals native to this archipelago are giant tortoises, which can live for more than a century. These are the creatures that provided Darwin with the flash of imagination that led to his theory of evolution. ..Immutable as the tortoises seem, they were utterly vulnerable to the buccaneers and whalers who took them by the thousands in the last two centuries. But one population eluded them. 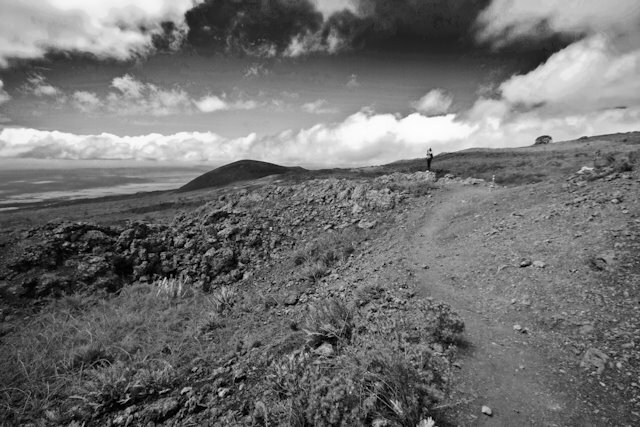 Inside the Alcedo volcano on Isabela Island, an earlier era lingers. This caldera is sealed off from the outside world by steep lava slopes that rise to 3,860 feet on the equator. It was not until 1965 that an Ecuadorian biologist found a way down inside and discovered a world where giant tortoises roamed in primordial abundance. This group had presumably never seen humans. They hadn't seen many more when I entered the time capsule of the caldera. For one memorable week, I lived among the tortoises of Alcedo. Photography one morning was one of those precious experiences where I could be part of a scene rather than a distant observer. 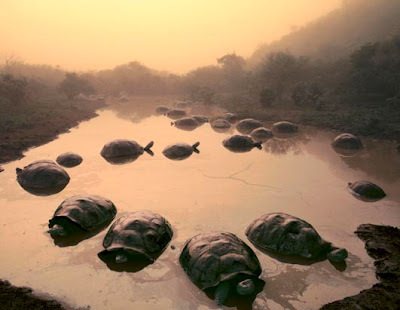 The tortoises were resting in a pond as soft mist mingled with sulfur steam from nearby fumaroles and dust from an erupting volcano to the west, and I was able to create an image that evokes the era when reptiles dominated life on land. Now, the view of Alcedo is different. There are no tortoises to greet and awe you - only the beautiful desolation that comes with the heat and aftermath of volcanic eruption. It’s still stirring and awe-inspiring, though we do mourn for the way in which the creatures that first occupied this rugged terrain have been ousted by invaders such as wild goats and people. At an elevation of 3,707 feet and with a mid-sized caldera of 6.1 x 7.4 kilometers, Alcedo is believed to have emerged from the sea bed about 313,000 years ago. Like Darwin and Sierra Negra Volcanoes it has primarily shallow slopes and the caldera is just 25% of the height of the volcano. You can contrast this to the height of the calderas at Cerro Azul and Wolf which are about 40-60% of the height of the volcanoes themselves. Alcedo is very remote and extremely difficult to access. 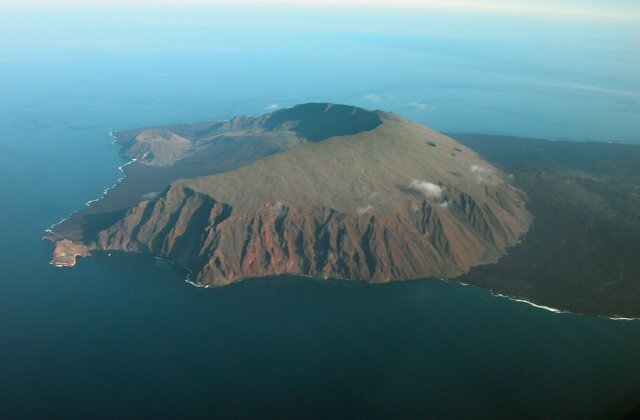 Its seclusion and inaccessibility meant that even the most recent eruption in 1993 was not recorded at that time and there are no videos or photographic record available. 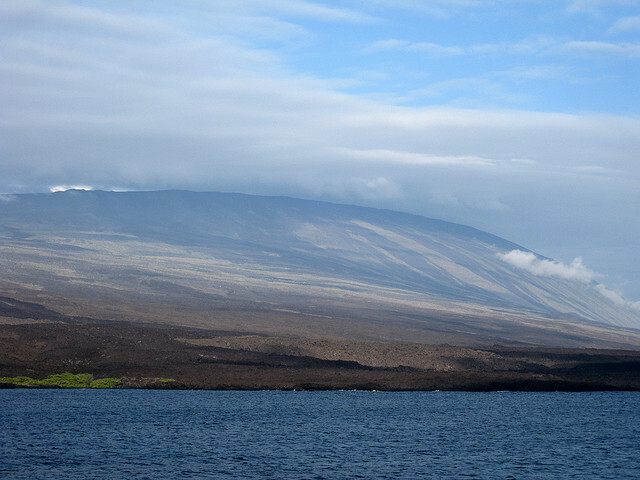 The first geological studies of the 1993 eruption were not done until 1995, when new topology was discovered by hikers. Scientific data and photographic records provide ample evidence that an earlier eruption took place between 1946 and 1960. 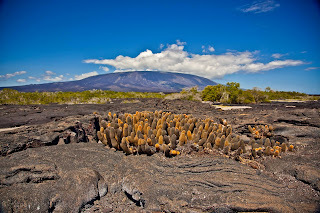 Alcedo is the only Galapagos volcano with both rhyolite and basaltic lava. As I explained in my Volcano Post, basaltic lava forms both Aa and pahohoe formations. Rhyolite, in contrast, is lighter and looks more like quartz and rocks. Rhyolite is rare, though not unheard of, in an oceanic environment like the Galapagos. Though only about 1 kilometer of rhyolite erupted at Alcedo, it is an interesting and unique feature. The most likely reason for this distinction is that Alcedo is nearly extinct, has moved away from the hot spot, and, therefore, the chemical makeup of the magma changed before the final eruption. As stated above the National Park Service strictly limits visits to Alcedo. It does, however, provide detailed visitor information on its website. 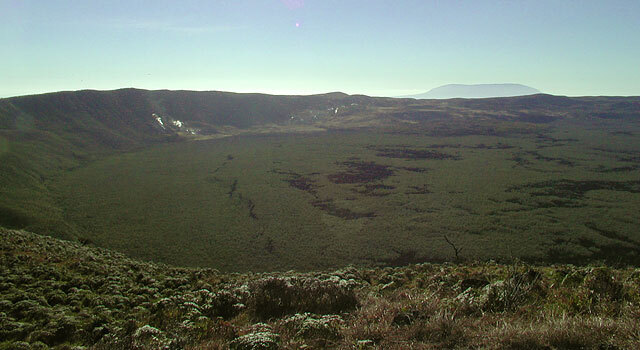 Volcan Sierra Negra erupted for nine days in 2005. I saw this eruption first hand and must share that this was a once-in-a-lifetime awesome experience. There is stunning footage available of this dramatic natural phenomenon. Here is a video from the Hotel San Vicente available on Youtube. Like the others on Isabela, Volcan Sierra Negra is a large shield volcano. 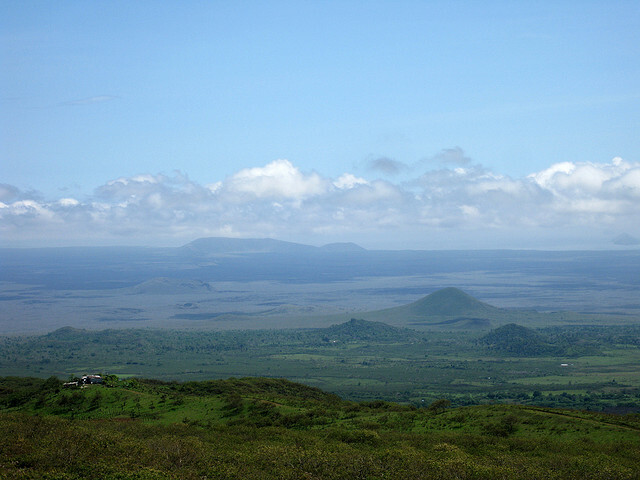 It is believed to be about 535,000 years old, and probably the oldest of Isabela’s volcanoes. According to some geologists, the wider and shallower a caldera, the more ancient. 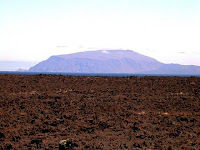 This conclusion is reached by theory and observations which indicate that volcanic processes in calderas tend to break down its edge, then the material from the edge fills the caldera. This theory definitely is consistent with the topography of Sierra Negra as its caldera is the largest of all in the Galapagos and the second largest in the world; it has a long southwest/northwest axis of 7.2 x 9.3 kilometers. 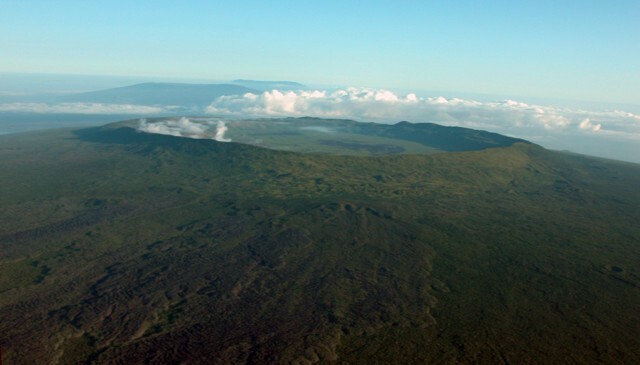 Sierra Negra, which appears like a typical shield volcano's upturned soup bowl, has an altitude of only 3688 feet (compare this to Wolf for example at 5600 feet). It is located east of Cerro Azul and south of Alcedo. Unlike Volcan Wolf, with a grade up its steep sides of up to 35 degrees, Sierra Negra’s slopes vacillate between only 2 and 5 degrees, making it a much easier and more accessible hike. From Sierra Negra the views are impressive; photographers will be thrilled. This is an active volcano. Interestingly, although there is regular GPS monitoring of all the Galapagos volcanoes, there was no advance warning of the eruption in 2005. 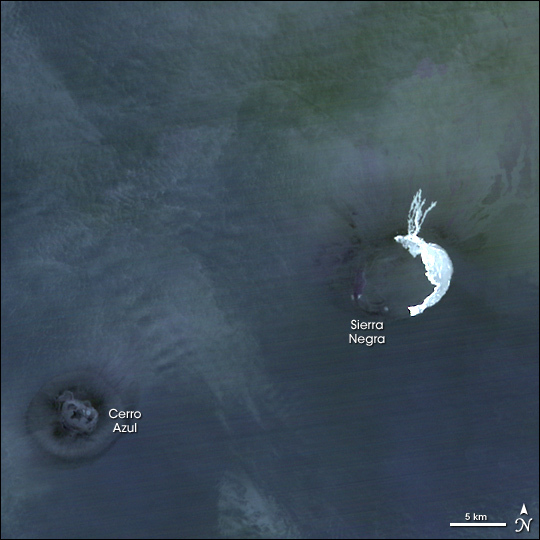 According to United State’s Geological Services, there had been an ongoing expansion of Sierra Negra’s caldera floor that had been monitored since 1992 but no short term signal gave advance notice of the eruption. For more information about the monitoring, see, A volcano bursting at the seams: Inﬂation, Faulting, and Eruption at Sierra Negra Volcano, Galapagos. 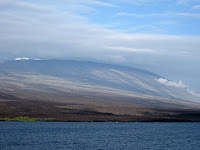 The lava flow in 2005 covered much of the interior of the caldera and in some places rose more than two meters. 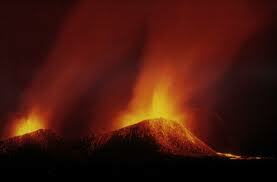 Other eruptions in the historical record are 1911, 1948, 1953, 1954, 1957, 1963, and 1979. Eruptions in earlier years are recorded by dating lava flows but their location on the volcano and the dates of the eruption are not known precisely. Unique to Sierra Negra are the fumaroles off its western caldera. A fumarole is a smoky and steamy opening that emits gases. 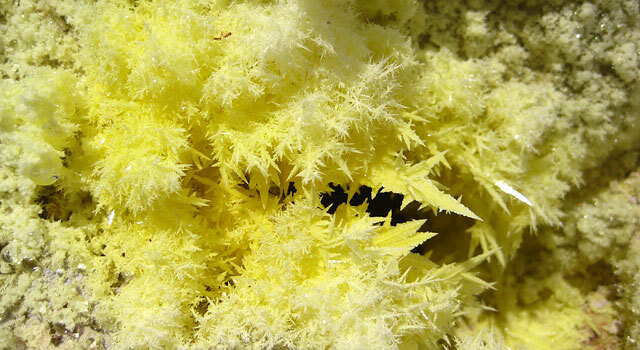 Here, you will see terrestrial sulfur flows; these are associated with the melting of sulfur deposits. See the Sulfer Mine discussion in my blog post about Isabela Island visitor sites. Click here, for more information about fumaroles generally. 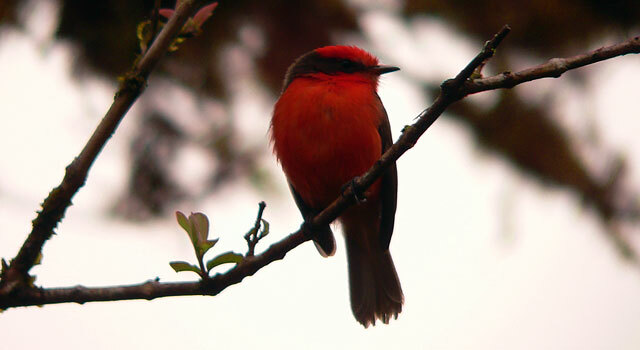 The wildlife, birdlife, flora and fauna at Sierra Negra are impressive as well. Seven species of finches have been identified here. The vegetation is variable and rich. The southern and southeastern slopes are the habitat for the Sierra Negra saddleback tortoise, Geochelone Nigra Gunther. This species is under threat from illegal hunting and as a result is part of the National Park Service’s captive breeding program. Accessible from Sierra Negra by footpath and horsetrail is Volcán Chico, just northeast of Sierra Negra volcano at an altitude of approximately 860 meters. 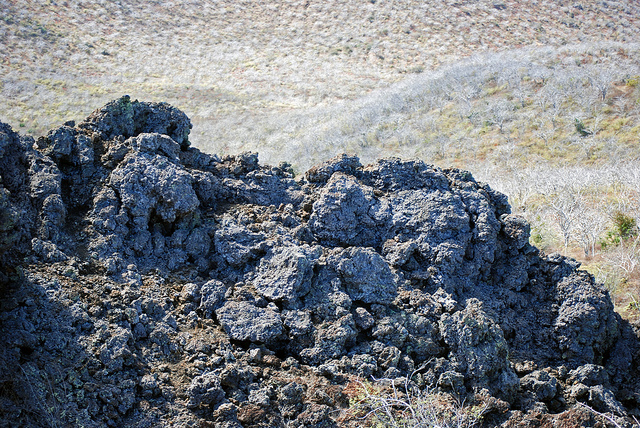 Volcan Chico is a fissure of some parasitic cones, composed of slag and lava. It last erupted for two weeks in November 1979 and before that on April 13, 1963. 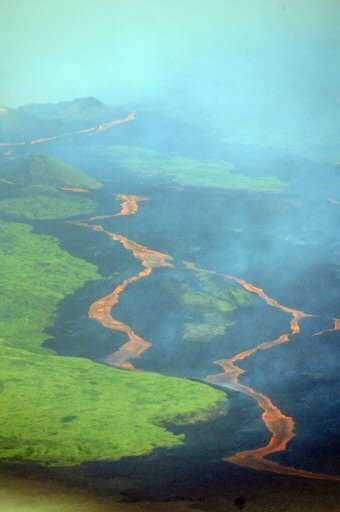 The 1963 eruption, stronger and lasting for one month, dramatically impacted Volcan Sierra Negra.The lava flows fell to Elizabeth Bay and covered a large sector east of the Sierra Negra volcano, consuming large sections of vegetation. 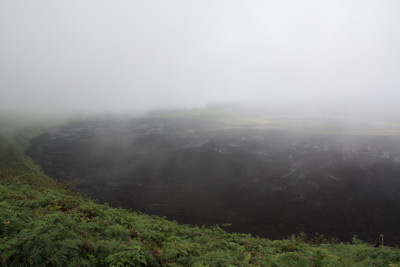 There can be a substantial difference in the weather at Sierra Negra and Volcan Chico as Chico is usually clear while Sierra Negra is often overcast. Both Volcan Sierra Negra and Volcan Chico are accessible from the town of Puerto Villamil. From town you can rent a vehicle and drive about 45 minutes to the site "El Cura" to rent horses. 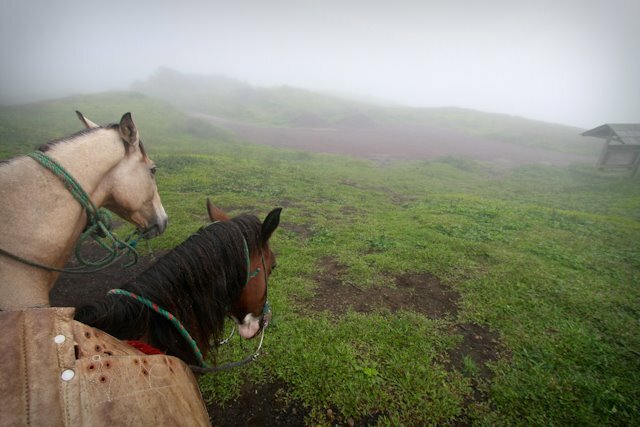 The horses will take you up the eastern side of the caldera of Sierra Negra to the site named "Los Jaboncillos" a place where horses are tied to continuing the journey on foot to Volcán Chico. The trek is about 10 miles and not for the faint hearted. But, most who attempt the challenge are greatly rewarded for their effort. One reason this is not an easy trek is that the weather can be unforgiving; rain and drizzle are likely; it’s easy to get lost in the fog. The Galapagos National Park Service warns that your group must remain together at all times and able to recognize certain outstanding features of the land so as to permit the return by the same route in the mist if necessary. Still, for those seeking adventure, experience and emersion into the Galapagos Islands’ environment, a trip to Volcans Sierra Negra and Chico will provide it. 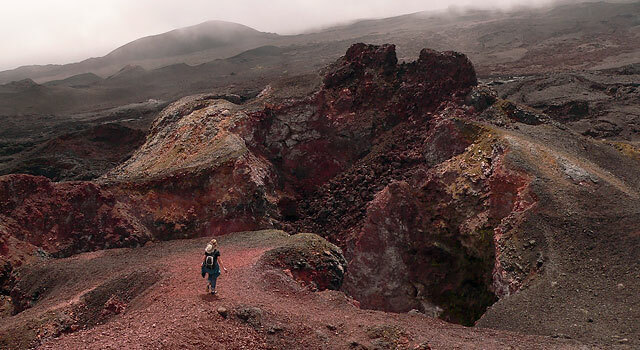 For a beautiful description that will make you feel that you are actually experiencing the trek to the two volcanoes go to an article written by Rebecca Newman for the Financial Times of London. She will take you there. Or, for a totally different viewpoint, read this description by romance author and humor writer Cindy Procter-King. I've said before that I take great interest in how different guests can have such different, yet equally valid, impressions of the same places, how the impact of nature changes for each person. Reading these two articles, you actually get the wonder and beauty of the volcano's impact from two distinct perspectives. I wonder how you will feel when you visit. Speaking for myself, the beauty touches my heart every visit I make. For more footage of the actual 2005 eruption of Volcan Sierra Negra, go to National Geographic. Cerro Azul "blue hill" is the second highest peak in the Galapagos at 5541 feet (only Volcan Wolf is higher). It is characterized, therefore, as an ultra volcano (a volcano of at least 4921 feet - 1500 meters). 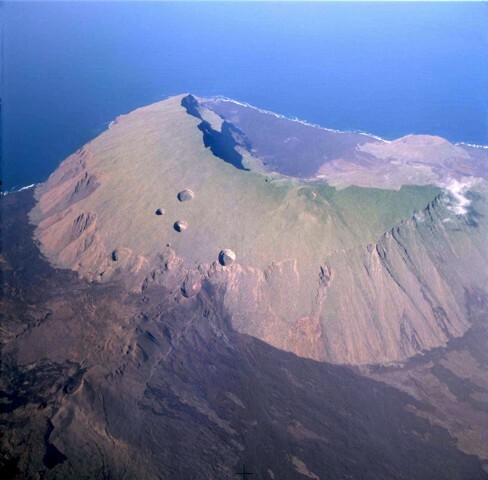 With only 1515 such peaks in the entire world, it is significant that Isla Isabela, in its small area, contains two. Think of it this way: even mountains such as the Matterhorn do not achieve ultra status because they are not free-standing mountains, but rather connect to higher mountains by passes without substantial individual prominence. A visit to Cerro Azul is a once-in-a-lifetime experience. Cerro Azul is a standard shield volcano characterized by its inverted soup bowl appearance and the size of its caldera. Though not as wide as some (this caldera is just 5x5 kilometers across), it is the deepest, at some points 650 meters below the caldera rim. Cerro Azul is located on the southern western tip of Isabela and differentiates itself on its western slope where it drops directly into the ocean. This is an extremely active volcano and must recently erupted in 2008. However, historic records dating back to 1932 document volcanic activity also in 1940, 1943, 1949, 1951, 1959, 1968, 1979 and 1998. Geographical surveys show that though the surface of the volcano is young, less than 5000 years old, the volcano itself is about 350,000 years old, about the same as Sierra Negra and Alcedo. 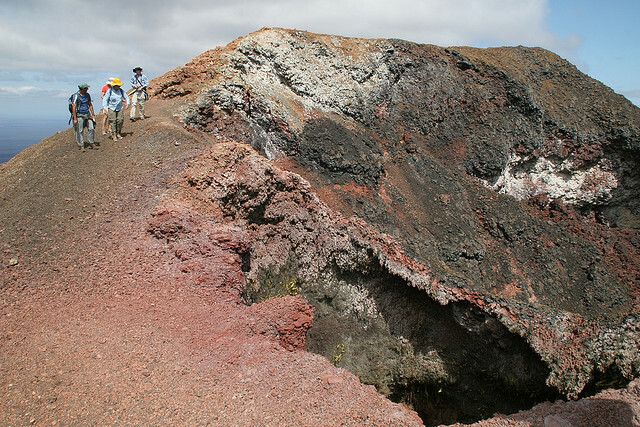 The 2008 eruption began in May and continued into June and included a fissure eruption on the south east flank of the volcano; the eruption in 1998 had also included fissure eruptions on this part of the volcano. The fissure eruptions resulted in lava flowing 10 km (6 mi) from the fissure. There was also an eruption within the caldera. The dual activity is somewhat unusual. Also notable is that because of Cerro Azul’s remoteness, it is likely that many eruptions over the last several hundred years have gone unnoticed. Read this interesting insight and description written in 2008 at the time of the actual eruption telling about what was happening at the time and the quandary that the scientific community found itself in: should they or should they not interfere with the wildlife at the scene? It’s so fascinating to get this very unique insight into the thoughts of those experiencing the dramatic changes in the Galapagos environment. For a video of the activity at the time go to this video from National Geographic. A subspecies of Galapagos Tortoise known as Geochelone Nigra Vicina lives at Serra Azul. 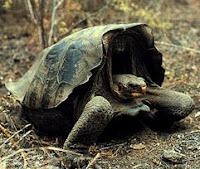 It is characterized by its domed shell and has an overlapping range with the subspecies on the neighboring Sierra Negra Volcano, Geochelone nigra guntheri, which is a saddleback tortoise. The Cerro Azul tortoises were not affected by the 2008 eruption although the 1998 eruption did force the National Park authorities to move tortoises by land and helicopter. Other tortoises were killed in that eruption, either from lava or associated fires. Though many visitors won't get to Cerro Azul itself, those that do visit Isabela by boat will have the chance to cruise around it on their way back to to the eastern islands. Seeing it from the boat is a beautiful site as the distance provides a unique perspective and opportunity to see some younger and fully defined tuff cones as well as lava flows. Words cannot really do justice to the magnificence and awe of Isabela Island's majestic volcanoes. If you have the opportunity to hike the steeps slopes to just one, take full advantage. Better yet, see as many as you can because the stories of past, present and future of the Galapagos Islands are embedded in the rock, the lava, the plants, and the animals that you will see. Each of the volcanoes has the unique shape. The local inhabitants amaze with their extraordinary views. The severe conditions made them change their appearance. Unreal beauty and diversity! The Earth is marvelous indeed! I hope they will be able to preserve biodiversity of the island.